The tenth edition of the Regional Congress on Health Sciences Information (CRICS10) will promote an exchange on the current global and regional priorities of 2030 Agenda and its Sustainable Development Goals, analyzing the contributions of evidence and knowledge. The Congress will take place in São Paulo, Brazil, from December 4-6. 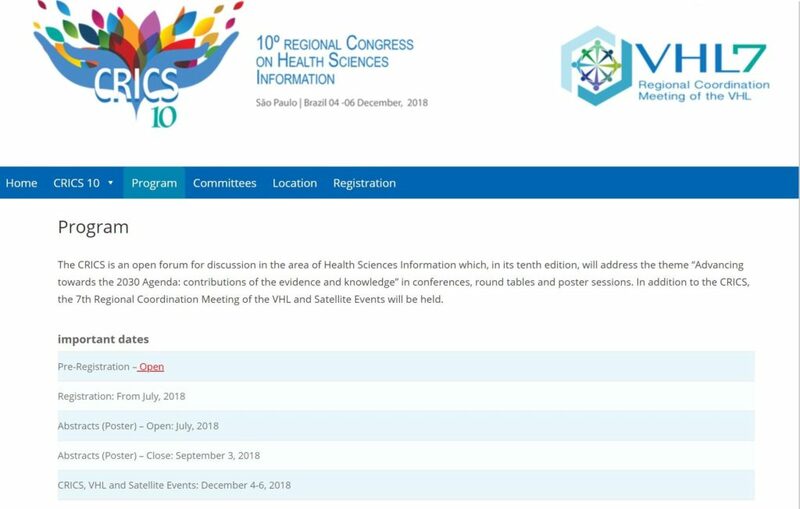 All abstracts will be evaluated by the Scientific Committee of the Congress and the following criteria will be considered: pertinence and relevance of the content to the topic and subtopics of CRICS10 and quality of the information. The submission will occur exclusively through the online form available on the CRICS10 website and must include a descriptive abstract of the experience or research with a 400-word limit, to be written in one of the following languages: English, Spanish, French or Portuguese. There is no limit to the number of papers that can be submitted by the same author. The selected posters will be presented by one of the authors, exclusively in the electronic poster modality (.ppt or .pdf formats), on December 5 and 6 in screens located at the event’s headquarters and composed of computer and Plasma TV. Come and join CRICS10 and share your experiences! Mark your calendar for important dates!